Jim coached the girls’ varsity basketball team at Sahuaro High School for 14 years (1987-2001) and won two 4A sate championships (1993, 1998) and twice was state runner-up (1999, 2001). His teams made the state final four five times, was region champion 11 years and second place twice. In addition, the Sahuaro girls’ team qualified for the state tournament 13 straight years, had 12 20-win seasons and an average record of 24-5 over Jim’s 14-year tenure. His overall record was 332-69. Scott was named Arizona Coaches Association, Arizona Daily Star and Tucson Citizen Coach of the Year in 1993 and also earned the same honors in 1998 and 2001. The 1998 Sahuaro girls’ team was named No. 1 Girls Basketball Team of the Century by the Arizona Daily Star. 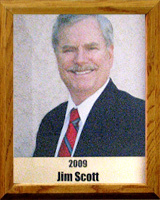 Jim also coached one season with the Sahuaro freshman girls’ team and had a 16-0 record. He also coached boys’ and girls’ track and basketball at the middle school level.